This is my day list. I use it every day. Today I updated and prettified it. If you’re trying to make one and want customized bullets, use Word instead of Publisher. My day list has been so helpful for me. I have memory problems and things an average person would have no problem remembering slip my mind and run away. Like somehow it’s a trap and they finally escape. So awhile back I decided to make myself a list of things I need to do every day to remind me. I put it in a page protector (clear plastic cover) and mark off each thing with a dry erase marker as I do it. I made a space on my wall to hang it last night because I keep losing it. My day list gets me through the day. 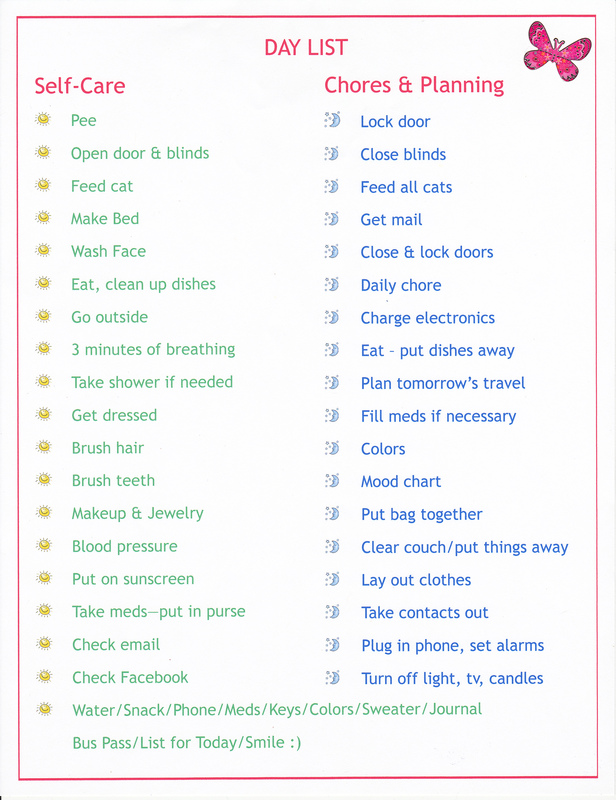 The day list has helped me keep up with self-care when I’m really depressed and make sure I come back to basics when I’m manic or agitated. I find that when I’m doing better I don’t need it as much and when I’m doing exceedingly bad I don’t even remember I have one. Thankfully, my psychiatrist reminds me. I feel accomplished when I do everything, which is pretty rare. I am grateful it reminds me what to take with me. I made it. I love it. I’m proud of myself. Think about what you NEED to do every day (not what you think you SHOULD do or what someone else thinks you SHOULD do). Write those things down in an order you are most likely to do them. Place the paper in the sheet protector. Put the list in a place you’ll see it every morning, next to a dry erase marker.